The Next Generation is here ! J. Gabriel Guajardo, M.D., specializes in obstetrics and gynecology services in Brownsville for women at all stages of life. A Brownsville native, Dr. Guajardo has been providing Obstetrical and Gynecologic services to serve women’s health care needs in Brownsville , TX since graduating in 2006. 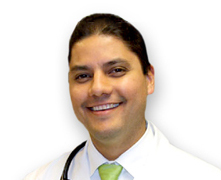 Dr. Guajardo is Board Certified by the American Board of Obstetrics and Gynecology. Offering the latest in general Pregnancy and Obstetrical Care to his Brownsville patients, including ultrasound services, genetic counseling, and amniocentesis testing, this Brownsville Physician is also knowledgeable in the management of high-risk pregnancies. Other obstetrical and gynecologic services include in-office procedures, ambulatory services such as well-woman / annual exams, menopause and infertility consultations and treatments, minimally invasive and laparoscopic surgery and surgical services. Dr. Guajardo’s professional approach centers on the long-established values of respect and courtesy and in addition he makes every effort to educate his Brownsville patients so that they understand their medical condition and treatment. The highly trained staff at this Brownsville Doctor’s Office is committed to providing the highest quality healthcare.